In February of 2006, at the age of 83, Leah Chase launched the reconstruction of Dooky Chase’s Restaurant, an anchor for the Treme community that was devastated by Hurricane Katrina. For Leah, there was never a question of whether she would rebuild the world-famous restaurant – or where. Dooky Chase’s doesn’t belong to her, she insists. It belongs to the neighborhood. And she genuinely believes it is her personal responsibility to ensure that both are rebuilt. No one who knows Leah would doubt her. She is a tireless worker who has also learned from experience the art of persuasion. She can lead. She can charm. She knows how to accomplish challenges that for others would be out of reach. How else to explain her journey from small town Louisiana with no formal culinary training to become a world-renowned chef and cookbook author? Feeding people brings her happiness. Rich or poor. White or black. Before integration, it was Leah’s stuffed peppers and creamy white beans that brought people of all races and upbringing together. She has learned through experience that great things happen when people come together for a common cause. And she believes that a hurricane can’t change that. 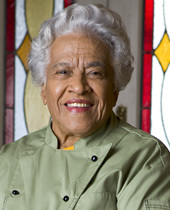 Experience has taught Leah Chase that when something needs to be done, it is up to you to accept the challenge. When Dooky Chase’s Restaurant reopens in January, it will be 65 years old and itself a champion for Treme and a symbol of hope for the entire City of New Orleans. The silver-haired and ever-smiling Leah Chase is the reason why. Leah Chase … Peoples Health Champion.